Bonnie Rochman (“The DNA Dilemma”, Dec 24th) is correct that “knowledge is power.” Currently, the greatest impediment to unleashing the knowledge within our genomes to improve our medical care is the ignorance or indifference of the medical community about how to harness this potential. A vast educational program is needed. Physicians see themselves as gatekeepers to this information and only value it if they have a fix that can be applied to the problems so identified. Some patients will choose to know their predispositions and some will not. Some of us have been seeking them out with tests like 23andMe and then taking the results to our physicians. All these options should be open in the land of the free. Information encoded within our DNA is owned by us—not by the medical establishment. It should be made accessible to those of us who want to be partners in our own health care decisions. It is not something to be doled out paternalistically when the medical profession is ready to offer us a fix for a defect. This information is valuable to us in making other life decisions. This is even more essential in guiding our decisions when current medical practice has no current fix to offer. Patients and physicians should be partners in discussing how this information should be applied. It is not something from which the medical profession is ethically bound to protect us. By sharing the information and the responsibility for its use, all are empowered. The right to protect some or all of us in our society. It's a zero sum game. One of those rights cannot be advanced without another retreating. It is clearly a case where one answer does not fit all people or all situations. Read the article. Discuss it with your family and physician. Comment on this blog and in other forums. 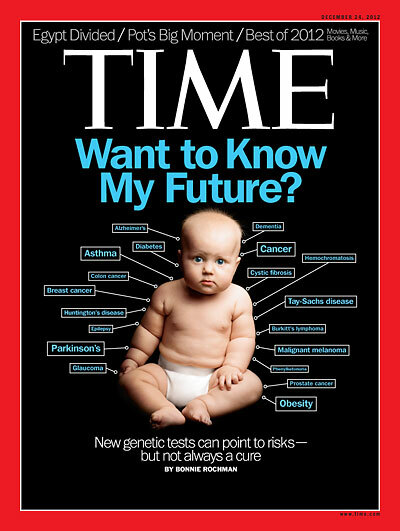 Labels: 23andMe, Bonnie Rochman, Intellectual Property, Privacy, protect our society, right to know, Time Magazine, zero sum game. Indeed a great letter but what is lost to me is the ability to have one difined standard of results for use in genealogy. Thank you all for your kind remarks. Anonymous, you may be on to something. Could you elaborate a little more about what you would like to see? Thanks for the article! Discussions could allay fears end users of this emerging science may have regarding the ethical use of data discovered in testing. // Also, Like Anonymous, I am a bit stymied by the lack of standardization among the companies competing for the business of amateur genealogical researchers. The results of autosomal testing, especially, can vary greatly from company-to-company. I suppose it is a result of the race for profit vs. the race to publish. 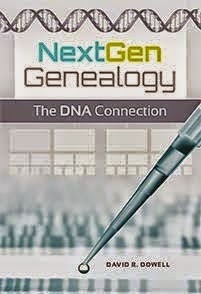 But the net effect of incongruous test results is that it becomes difficult to trust DNA testing.